You can’t state clearly the difference between you and other agents. You dislike cold calling strangers. Your marketing isn’t paying for itself. Marketing is the #1 skill to have! Sell anything to anybody anytime—and make them love it! Why is your income in direct proportion to the quality of your questions? This is the course outline for The Principles of Business course AND The Principles of Marketing course. Once you learn The Principles of Real Estate, learn the Principles of Business and Marketing; the next step in education toward becoming the Top Producer you want to be. The Real Estate Business Blueprint® is a set of plans that shows Realtors® how to run their career more like the business it is. 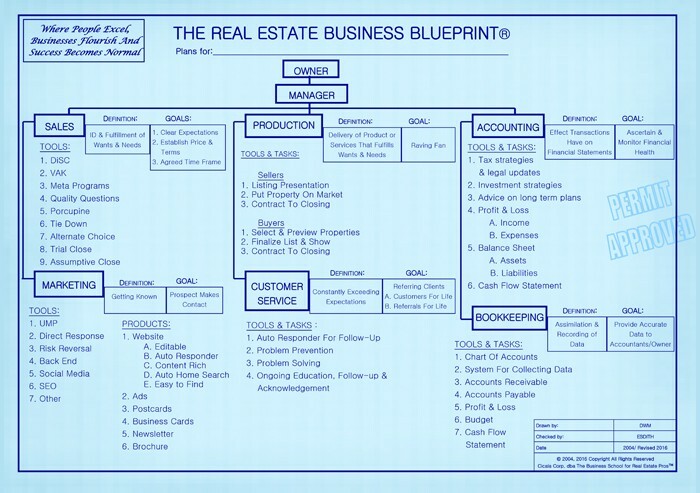 The Real Estate Business Blueprint® shows the six components of a business, the definition and goal of each and how they all function and fit together to form a synergetic whole. These classes are taught by Experiential Learning; simulated business games, activities, rock and roll music and lots of fun. Music? Fun? Business education? Financial Freedom? The Business School for Real Estate Pros®. Where people excel, businesses flourish and success becomes normal! GUARANTEE: If at the end of this course, you do not feel you received your money’s worth, we will cheerfully refund your tuition in full!